Rodrigo Medellin, a Mexican expert on bats (Mexico’s Bat Man) was the winner of the 2012 Whitley Fund for Nature Gold Award for his on-going work to study, raise awareness and highlight the importance of Latin America’s bats. The award reflects Medellin’s outstanding contribution to nature conservation. 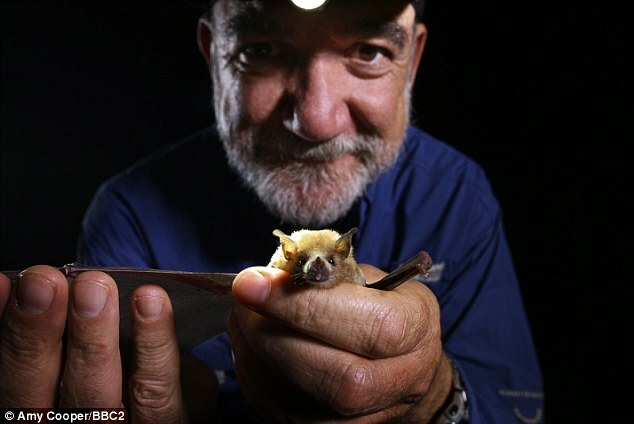 Medellin, an ecology professor who, among many other achievements, has found bat species previously thought extinct, was the subject of an episode in the 2014-2015 season of the BBC series Natural World. The documentary won the 2014 Panda Award for Best People and Nature Film. As a child, Mexico’s Bat Man kept vampire bats in his bathroom and some of his own blood “in the fridge so that I could feed them every night”. Rodrigo with a lesser long nosed bats Credit: Amy Cooper, BBC2. Bats are more important to ecology, and Mexico’s economy, than you might think. For instance, the lesser long-nosed bat is the main pollinator of the agave plants from which tequila is produced. Medellin’s research has involved tracking and understanding the extraordinary migrations undertaken by bats such as the lesser long-nosed bat, which pollinates the agaves during its annual migration. (Worldwide, bats also propagate at least 500 other economically important night-flowering species). The bats’ journey covers 1500 kilometers (almost 1000 miles) from southern Mexico to the Sonoran Desert straddling the Mexico-USA border, via the so-called ‘Nectar Corridor’, the coastal lowlands between the Western Sierra Madre and the Pacific Ocean. Indeed, in the desert region, the lesser long-nosed bat is responsible for pollinating the distinctive saguaro cactus (which is incapable of self-fertilization), the key to the whole Sonoran ecosystem. Elsewhere, bats can be a tourist attraction, as at Bracken Cave, Texas, home to an estimated 20 million Mexican free-tailed bats. in addition, fruit-eating bats help stimulate the regrowth of rainforests, by distributing five times more seeds per square meter than birds. Medellin has devoted his life to ensuring the conservation of bats in Mexico and, fortunately for all tequila lovers, appears to have been successful. Because of his work, the Tequila Bat is now off the endangered species list. Over the past three decades, Medellin has campaigned tirelessly for people to appreciate the value and beauty of bats, creating a network of bat-friendly ‘safe caves’, and pioneering conservation techniques that are now being copied around the world.